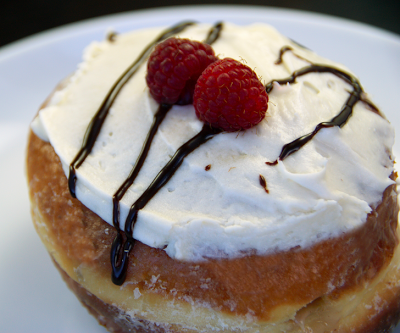 We are going to debut a Mimosa donut made with champagne chocolate buttercream tomorrow. It is going to be a Sunday regular from now on. What better than a Mimosa to go with Sunday Brunch? A Mimosa donut of course! Also, we'll have heart-shaped bismarck's with vanilla bean curd and strawberry buttercream in the bakery--but ONLY this Sunday! Be sure to stop by to pick up this lovely item for the special Mom in your life. Since these are so new, and so good. All our test baking samples were eaten before we could get a photo, so we'll tempt you with a view of the similar Vanilla Creme Bismarck.